Situated at the mouth of the Daugava, the city of Riga is the capital of Latvia and the biggest city in the Baltic States. It has emerged from behind the Iron Curtain and is slowly coming into its own as a major European tourist destination. Situated on the south-western coast of the country, Riga is split in two by the River Daugava, and served as a major trading port and a crossroads between western Europe and the East. The modern founding of the city dates back to the 12th century with the arrival of German traders, mercenaries, and missionaries, while its older roots date back to a settlement of the ancient Finnic tribe, the Livs. Riga boasts a collection of exquisite Art Nouveau buildings that rival those in Vienna, Barcelona, and St Petersburg, and the fairytale-like historic city centre is a delight to explore. 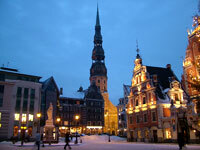 As the cultural and economic centre of the country, Riga is home to plenty of top-class museums, galleries, and performing arts centres, as well as a range of sophisticated bars, clubs, and restaurants. The city is fast gaining a reputation as a party capital, and its vibrant nightlife draws hundreds of weekenders from all over Europe. For a more traditional Latvian experience, it is well worth braving the winter cold to enjoy a spot of ice fishing, ice-skating on the frozen Daugava River, or a pirt - a rigorous sauna that involves being beaten with dried birch branches. With over 800 years of history, a UNESCO World Heritage Site-listed historic city centre and a modern buzz, Riga remains a largely undiscovered gem with plenty to delight and enchant the visitor.